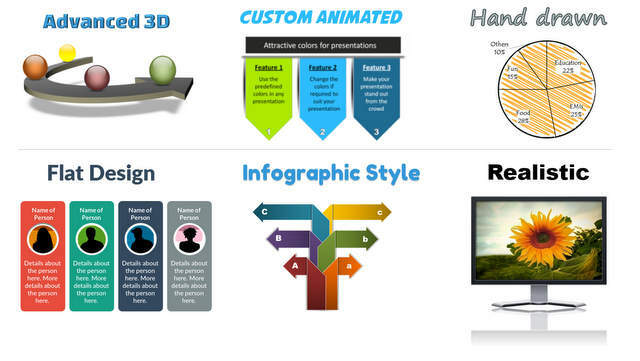 It's an amazing resource of templates, SmartArt graphics, help videos and tips that you have everything at hand to build a professional presentation. I spend less time in searching for the right template or a specific clipart. Impress ﻿﻿﻿your﻿﻿﻿ boss & your audience with your slides - without spending hours struggling with PowerPoint! You don't need to keep looking for creative ways to present boring bullet points or complex slides any more. Enjoy 50 different and creative ideas downloaded to your desktop every month. It adds to the collection of resources you already have to makeover your slides. Get different topics every month. So your collection will build up into a treasure house of beautiful slides. 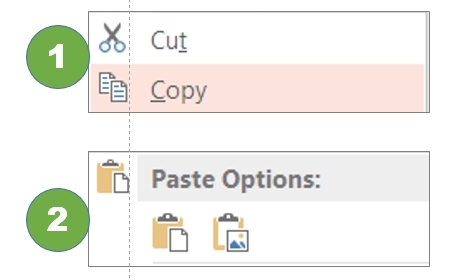 If you can Copy and Paste - you can use these templates easily. Just copy the template you want to use into your presentation. Copy the text from your old dull slide...and your new visual and creative slide is ready in a few clicks! And your audience will think you spent hours slaving over PowerPoint to create the slides! Fully Editable templates you can customize. 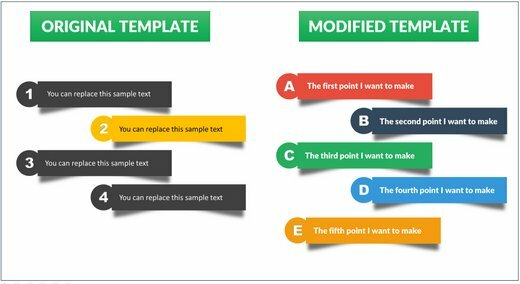 The templates are created within PowerPoint. 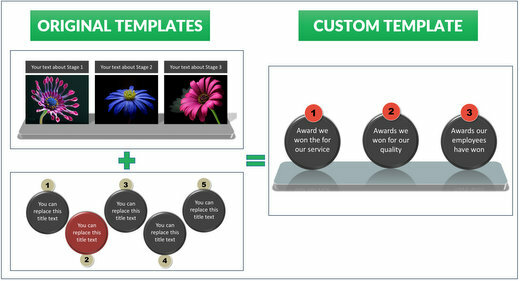 So you can pick up elements from different templates and create your own 100% custom slide! That is, you can create virtually unlimited custom templates if you want! You can create your Project presentation, Monthly reports, Sales pitches, Meeting presentations, Training content, Church presentations, ﻿School ﻿& Phd Project presentations and more. Customers from a wide range of industries use it...from IT Consulting, to Marine Training to Phd. Students writing their thesis! The text in the templates is just placeholders. So you can replace what is written easily. We have customers from 200+ countries and they use our templates to create presentations in English , Chinese, Spanish, Arabic, Japanese, German & other languages. You can save your presentation as PDF files for sharing. You can create engaging videos and training with voice over. You can use the diagrams as images to liven up your website, blog or brochure. Our customers even use our diagrams to create engaging resumes and interesting ebooks! Access specially crafted step-by-step training videos on using templates. 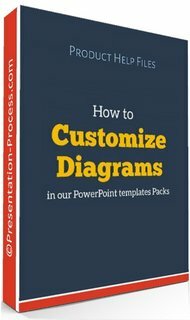 Includes 3 part series on how to design your own diagrams using the templates. 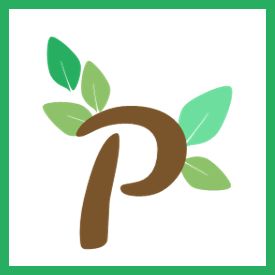 PDF file with list of free tools we use at Presentation Process to enhance our PowerPoint presentations. 2Checkout.com Inc. (Ohio, USA) is ﻿﻿﻿a﻿﻿﻿ payment facilitator for goods and services provided by BIZPREZ TRAINING LLP. If you are not satisfied with your purchase write to us and get 100% money back within 30 days of first purchase. This is a subscription option and you﻿﻿﻿ ﻿﻿﻿will be charged monthly. You can cancel anytime. Easy cancellation option is available within your member area. I do not need to think of design, ppt flow, boring bullet points transformation or text for the matter. I just need to know what i want to present and how i want to present before converting that into the fresh templates. Your presentation slides have help me to glue to attention of my audience. I give technical presentation and solution presentation on GIS and use of Street View technology. I find an opportunity now to leverage these ready-to-use templates to make greater impact on business and training related presentations. I can concentrate more on content than on form. Start your collection of Fresh New PowerPoint slides. What happens as soon as I enroll? Once you complete payment successfully, 2 emails are automatically sent to your registered email ID. You can use the details from the email to download the first 50 Fresh templates immediately. Please ensure that your email ID is entered correctly so there is no delay in delivery. What are the ﻿﻿﻿license﻿﻿﻿ terms? If there is a large team of people in your organization who will need to subscribe to the templates, contact us about a multi-user license. Help! I have an issue ﻿﻿﻿checking﻿﻿﻿ out. That's great. We really appreciate your trust in us. The templates that you will receive in this subscription option will be different. They are not the same as ANY of the template packs currently sold on Presentation Process website. So you can add 50 Fresh templates every month to your existing collection of templates! What happens if I choose to ﻿﻿﻿cancel﻿﻿﻿ the subscription? You can cancel your subscription using the login provided or write to us. Once you cancel, your login to Members area will be disabled. The templates you already downloaded are yours to keep for a lifetime. You can continue to create presentations with them. You can use the presentations you already created with the templates. As long as you are subscribed you can download the templates shared in the previous months again. What﻿﻿﻿ are the system ﻿﻿﻿requirements﻿﻿﻿? Are there any ﻿﻿﻿watermarks﻿﻿﻿ on the templates? How does the Money ﻿﻿﻿Back﻿﻿﻿ Guarantee Work? If you are not absolutely satisfied, you can ask for a 100% refund within 30 days of first purchase. The refund request is very simple. You will receive an email with the download link and transaction ID. Save that email for future reference and just replay to it or use any contact form on the website. Your subscription will be automatically cancelled and you will not be billed further. After the first month, you can cancel the subscription anytime. Mail Me When The Club is Open! We will only use this information to mail you about Fresh Templates Club.